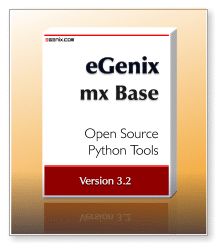 If you are looking for a Python 2.7 version of mx Base, please download our pre-release 3.2.0 snapshot. We are still working on adding full Windows x64 support to some of the sub-packages and will release 3.2.0 once this has completed. Note: The Solaris downloads have not yet been updated to 3.1.3 or Python 2.6. They still point to the 3.1.1 version of eGenix mx Base. You may want to download and install the distribution from sources (see below). Note: The AIX downloads have not yet been updated to 3.1.3 or Python 2.6. They still point to the 3.0.1 version of eGenix mx Base. You may want to download and install the distribution from sources (see below). The above link to the source file still points to version 3.1.2, since 3.1.3 apparently introduced an incompatibility with easy_install.